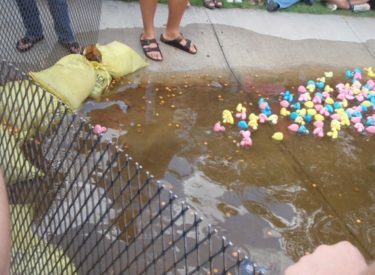 The 2010 Liberal Chamber Of Commerce Duck Festival culminated with the Annual Duck Race. A record number of ducks were sold this year, with a large crowd gathered at “Ducky Downs” to cheer on their ducks. First through the chute this year was a duck purchased by Catherine Colvin winning her $6,000.00. Second place and $2,000.00 went to DeLari George, while Joyce Wigner’s duck came in third for a $1,000.00 prize. In fourth was Suzanne Nix’s duck earning her $500.00, and the hard luck duck drawn from the remaing ducks belonged to Martha Cherry. It was also worth $500.00.